Before I get started, let me be clear about one thing: The title of this post does not refer to our president’s concerns about the southern border. 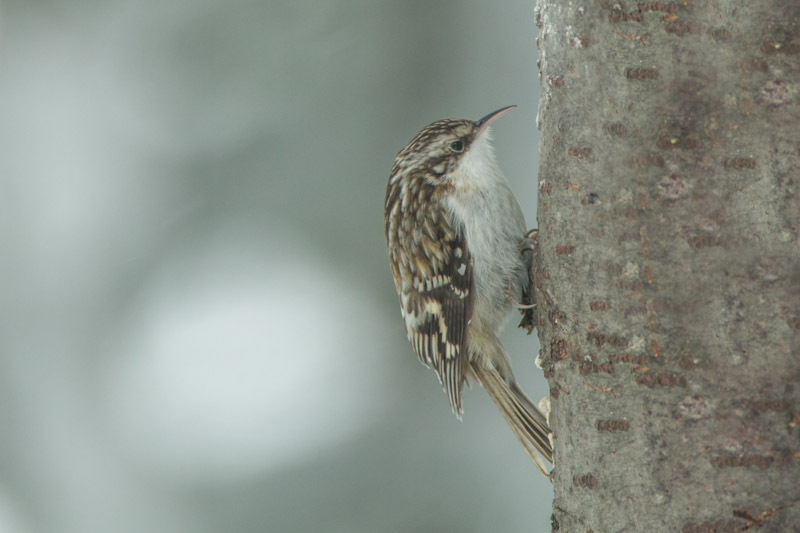 The Brown Creeper is a bird. Kim and I have been pursuing the Brown Creeper for years. When we lived in Gainesville, our birding guru, Rex, would report sightings and we would eagerly go to where one was reported, but we never saw one. We may have been looking right at it while failing to see it – Kim can attest that I do this often. They are difficult to see. They hang out on tree trunks, searching for food, and their streaked brown coloration blends right in with the bark. “If you build it,” the famous line goes, “they will come.” We did not build a Field of Dreams, and we did not see Shoeless Joe. We built the Bark House, and the Brown Creeper came. Like many in our bird family, and a few squirrels, they have made themselves at home on our home. Because of our bark siding, they think we are a tree. Nuthatches take seeds from our feeder and store it in the bark on our porch, sometimes pecking at the wedged-in seeds to open them. We’ve seen our Brown Creeper stealing from helping themselves to the Nuthatch larder. Sometimes they pause here for a brief nap. Brown Creepers, by the way, are very difficult to photograph. Though they are called “creepers,” they don’t creep. Sloths creep. Lions stalking wildebeests creep. 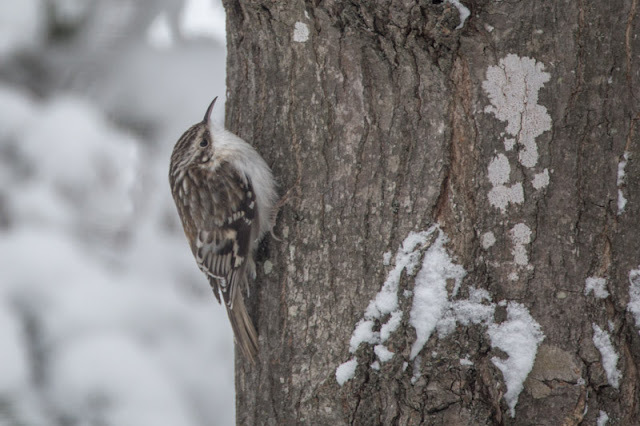 Brown Creepers move very quickly up the trees (Brown Scurriers? ), and even if you target them well, you still need a very fast shutter speed to freeze their action. 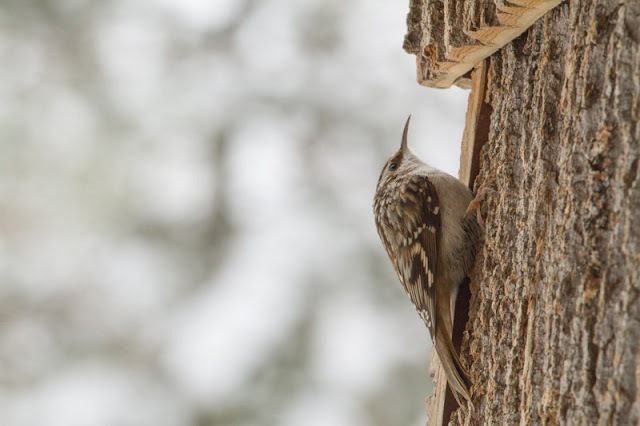 In Michigan’s generally dark and cloudy winters . . ..
Four species of woodpeckers (Downy, Hairy, Red-bellied, and very briefly, thankfully, Pileated) have checked our siding for insects, finding none. Squirrels, including the local Black Squirrels, frequently scamper along the bark, and they will sometimes stare at us through the windows, wondering how we got inside. We built it, and they came. We now have two of them, and we like to think it's a male and a female. We picture baby Creepers peeking out from a nest . . ..
Be happy that little birds are pecking on your house. I have a married couple of cranes that have been violently attacking my windows which are just about the right height for them. Surely they know that’s their own blood all over the windows and house. Only one effort has been successful. Cheap silver wreaths on windows and fishing line strung from poles surrounding house. Somehow I don’t think that’s a selling point.